"I think we have got to be very careful about loose talk of a European army. An army is a legally constituted armed force operating under the authority of a sovereign Government. 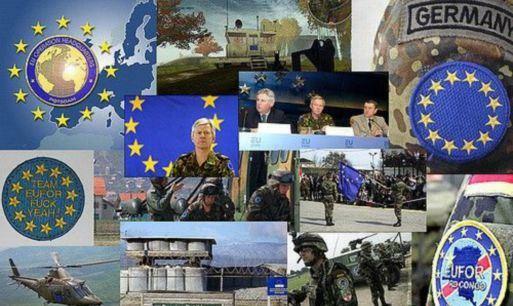 So, if you accept that definition, the notion of a European army is impossible until and unless there is a sovereign European Government, which is obviously not in existence. And I think it is some way off." The question may arise as to how Europe is to be prevented from developing imperial ambitions. The simple if banal answer is that this is not possible so long as Europe remains dependent on the United States and her imperialist and ultra-capitalist ambitions. European countries would in the first instance need a sovereign central bank with their own currency, in addition to a national army that could defend European territory. European elites are in fact moving in the exact opposite direction, and this can be seen almost in the daily activities and statements by leaders like Merkel and Macron. The creation of a European army, instead of guaranteeing greater political freedom and distancing the EU from the US, would only actually serve to buttress the ideology of Washington as the only world superpower.